Is this phone the (Atom) bomb? Intel dropped some of the biggest news of CES 2012 today, announcing that it was entering the smartphone chip market and adding an Atom chip into the new Lenovo K800. The Intel Atom chip has been in a number of devices from netbooks to smart TVs, but now that it has entered the smartphone market it's in more direct competition with ARM-based processors. Lenovo is one of two companies that has announced an allegiance with Intel, the other being Motorola, and it's not just smartphones where we'll see the new Atom processor Z2460 platform (Medfield). It'll be in tablets too. TechRadar managed to be among the first in the world to get its hands on the Lenovo K800, and we have to say that it's an intriguing mobile phone. For a start it's both a wide and a thick phone. In the hand it does feel rather bulky, but not enough to put you off using the thing. And it's more width than girth that makes it bulk out, since the phone is 10mm thick. The phone has a 4.5-inch TFT display, which is 0.1-inch off the size of the Sony Xperia S and it has a pixel quality of 720p. It's a neat-looking screen, and all the media we tried out on it looked the business. While the phone may look rather conventional - if a touch big - the operating system does not. It's running Android 2.3, but you wouldn't think so. Lenovo has added a thick skin onto the top of the OS, making it almost unrecognisable. For a start, there's a circular option screen when you power the smartphone up. This had a number of different shortcuts to apps. After some fiddling, we found that you could actually modify this screen. To do this you hold down the app you no longer want to be on the home screen and then you're ported to all the other apps within the phone. Click on the one you want to replace your discarded app and you're away. Because it's so heavily skinned, it took us a while to navigate to different parts of the phone. It feels like Lenovo wants you to use the home screen most of the time, instead of drilling through numerous menus to get to the feature that you want. To get to your apps, you have to click a small app virtual button on the top-right of the screen. You can also swipe left or right to see more screen options and to add a variety of widgets. Because of the power of the Intel Medfield chip inside the smartphone, the Lenovo K800 is very zippy. We managed to navigate to the browser, then the camera (which is a not too shabby 8MP) and a selection of apps with no lag at all - this does feel like one powerful phone. and an HDMI port, though, so it will be able to do processor-intensive features without too much fuss. This may have something to do with the phone launching in China first, before coming overseas later in the year. 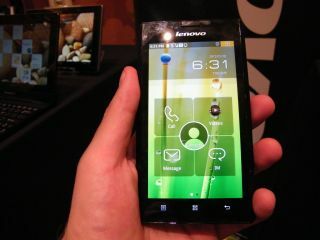 There hasn't been any word on a Lenovo K800 UK release date or price as yet, though. This is the second time Intel has tried to make a move into the mobile phone space. It had tried to do a similar thing with LG in 2010, but this partnership fizzled out. It will be hoping that it is two-times a charm, because the company badly needs to crack the mobile phone space to secure its long-term future in the chip market.